Riverglade Caravan Park is situated on the banks of the Tumut River, which flows from from the Snowy Mountains for nearly 145km before joining the Murrumbidgee River at Gundagai. The river and its pristine waters provide excellent fishing, canoeing, rafting and other water sport opportunities nearly all year round. 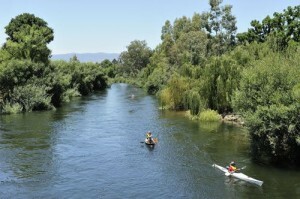 The summer months are popular for rafting, kayaking and canoeing. The Tumut River is fast flowing and cold and deserves respect but anyone can enjoy its beauty with a little tuition. There are miles of flat water for those who want a leisurely drift down stream or some more challenging white water for the thrill seekers. The Tumut Valley Canoe Club can give some pointers and visitors are welcome at their weekly meets just adjacent to Riverglade Caravan Park at 5pm on Wednesdays during summer. Fishing is a popular recreation activity for visitors and locals alike, and the Tumut River (in addition to surrounding water ways such as the Blowering Dam and the Murrumbidgee River ) is known for its variety of fish and ample fish stocks. 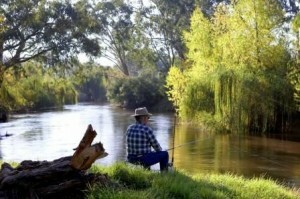 One of Tumut’s best local fishing spots lies on the Tumut River between the Riverglade Caravan Park and Mill Angle, or at the footbridge running over the Tumut River near the Snowy Mountains Trout Farm.